Mar. 5, 2014 8:00 a.m. 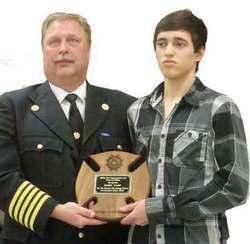 The MFD held its Award Night Banquet at The Millet Agriplex March 1, 2014. VIP’s attending the Awards Night were MP Blaine Calkins and his wife Barb, Sean Burke of 93.1 “The One” Leduc, from the Town of Millet Mayor Rob Lorenson, C.A.O. Teri Pelletier, Assistant C.A.O. Lisa Schoening, along with Councillors Pat Garrett, Eleanor Pydde, and Carol Sadoroszney. Wetaskiwin County Fire Chief Mike Zayjack and members Keith Johnson, Terry Van de Kraats, Kathy Rooyakkers, Gary Dearing, and Pearl Hay. East Millet Rural Fire Department Members Ervin and Linda Gantske, Doug and Bobbi Dinner, Larry and Lynn Fercho, Edgar Burghardt ,Dallas and Joyce Arnholtz, Mandred and Betty Kempalso attended. The evening was to acknowledge and celebrate the members of The Millet Fire Department. These are the people, as MP Blaine Calkins said, “run into situations that the rest of us are fleeing.” No matter how tired they might be, what promises they made to their families, the time of day or the weather, when the call comes in they drop everything to rescue us. The MFD currently has 28 active members who are responsible for one of the largest areas in the province. The hard working MFD covers the area that reaches from Township Road 480 to Township Road 470, and Highway 795 to Range Road 234. The total amount of calls responded to last year was 103, including 46 multi vehicle crashes, 34 fires and 7 for medical aid. On top of this, the MFD works with the community talking to schools, providing demonstrations, giving tours of the Fire Hall, participate in community events and attend practices. Fire Chief Blair Mohr, Deputy Chiefs Steve Moen and Karl Kilborn along with MP Blaine Calkins presented Braydon Sinclair – Smith with his Rookie Pin. One year pin recipients were Kyle McNichol, Delane Hanington and Sacha Mawbey. The Twenty Five year pin and service ring recipients were Deputy Chief Karl Kilborn and Lieutenant Larry Tall. Derek Chaney prepared and presented a video of the MFD in action. David White and his son Carter won the calendar award for best picture sponsored by the Town of Millet, while Ken Van Dieman won The Expose Your Hose Award sponsored by the Millet Acoustic Firefly Festival for having the mug that brought in the most money. Every once in a while life can put the most ordinary among us into extraordinary circumstances and a hero is born. Robin Camp is one of those heroes. On October 22nd, 2013 the MFD responded to a reported head on collision involving 3 vehicles, on Highway 2A near Township road 472. Local teenager Robin Camp was returning home from Wetaskiwin with his mother and sister when an oncoming car veered into their path at full highway speed. The Camp family van was on its wheels in the ditch, where it burst into flames. Despite the impact, Robin was able to free himself from the wreckage to assist his trapped and seriously hurt mother and sister out of vehicle. Robin’s actions certainly saved the lives of his mother and sister that night. Robin Camp was awarded an Award of Merit from The Millet Fire Department and The Town of Millet, in recognition of his selfless heroism on the highway that night. The evening was a great success with Chris Ible as MC and Two Dogs Plucking providing live music for the event. Thank you to all of the heroes and their families who sacrifice so much to help people they don’t even know.